The orchestra takes its name from the Okavango Delta, a basin in the Kalahari Desert in Botswana, where many different animal species come together to feed and find water. Predators and prey are forced to coexist and share the meager resources because of the harsh environment around them. Similarly, Okavango African Orchestra brings together the traditional music and instruments of several major African cultures that historically have had little or no interaction. The musicians of Okavango have created a common meeting place for these disparate cultures, and a new musical language that harmonizes their different tuning systems, rhythms, and timbres. The multicultural spirit of modern-day Canada bridges ancient African solitudes. They are on a mission to break real and perceived barriers between different African countries and traditions, creating a musical delta where everyone’s welcome to dip in and dig the grooves. 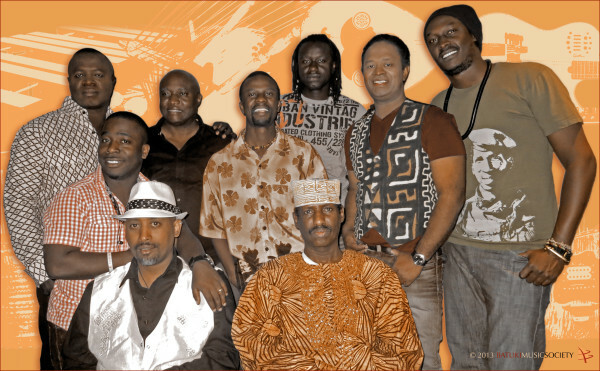 The group comprises nine accomplished African-born musicians: Daniel Nebiat (krar, vocals-Eritrea), Tichaona Maredza (marimba, nyunga-nyunga, vocals-Zimbabwe), Donne Roberts (guitar, vocals-Madagascar), Kooshin (kaban, vocals-Somalia), Ebenezer Agyekum (bass-Ghana), Sadio Sissokho (kora, djembe, vocals-Senegal), Nicolas Simbananiye (vocals-Burundi), Aron Nitunga (guitar, vocals-Burundi) and Kofi Ackah (percussion-Ghana). Click on thumbnail to view and download high-resolution photo.